As I settle back in to my life in Colorado, I have embarked on a frenzy of organization. This is how I manage stress over things in my life that I can't control: by imposing as much pleasingly visible order and structure I can on the things that I can control. I literally broke down in a fit of sobbing when I saw the huge amount of Indiana stuff I hauled in from my car to my offices at home and at work. There was truly no place to put it. But then I leaped into pitch-and-purge mode. I filled two large recycling cans at home with things like clipped magazine articles I might want to re-read someday, drafts of articles that were published long ago, folders of neatly sorted bills from 2006, 2006, 2008, minor reviews of books no longer in print. I filled an enormous recycling bin at work with correspondence files from the 1990s, dusty oversized envelopes containing all my teaching evaluations for the past twenty years, student papers from before I left for my two years away. I took heaps of clothes I will never wear again to Goodwill, as well as paperback copies of the plays of Euripides and Sophocles that I got for free at the teachers' conventions my mother attended in Atlantic City in the 1970s. I made doctor appointments, dental appointments, vet appointments; I got both cars emissions-tested and registered; I dropped off a shoe to be repaired (the kind of thing you can NOT do in Greencastle, Indiana! ); I deleted hundreds of accumulated emails; I made the world's most complete and massive to-do list for work, home, and life. And I felt SO much better about everything. How I love having everything finally under control! 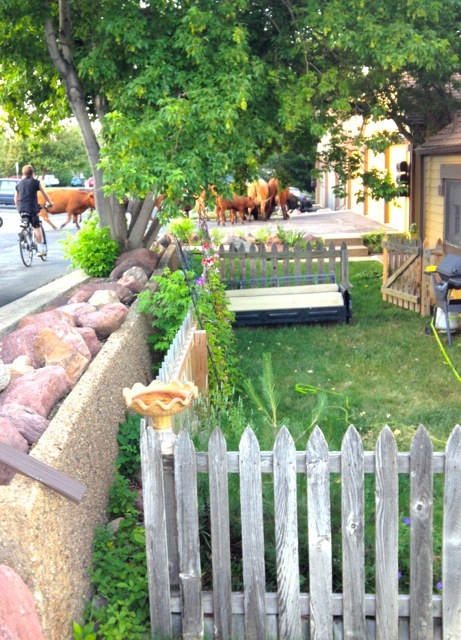 Of course, cows can't just wander through residential neighborhoods; they needed to go back behind the protective fence of their pasture. Order needed to be restored, and it was. But the walk was a good reminder that much as we (well, I!) may love and crave order, there can be a deliciousness in disorder, too, temporary breaches in the structured, predictable, controlled framework of our lives. I'm home in Boulder. My Indiana life is behind me (for now). 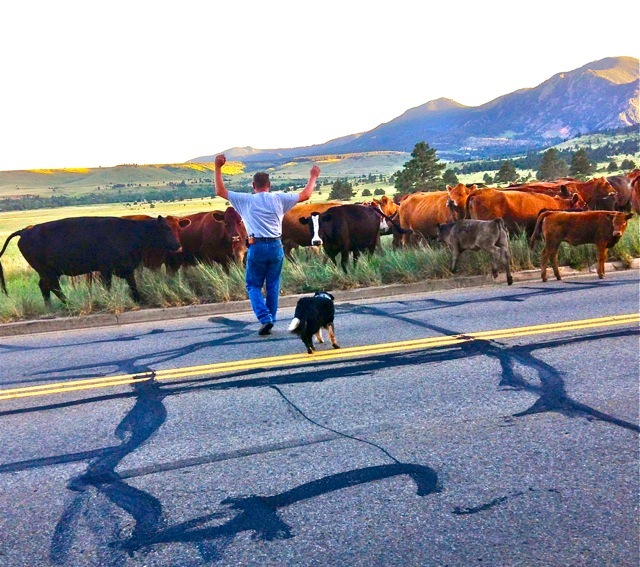 My Colorado life stretches ahead. It's somewhat wrenching and disorienting to be back. For starters, where am I going to put all the books, boxes of files, clothes from Greencastle Goodwill, souvenirs, and cookie jars that I acquired during my two years away? They simply won't fit in my little house. And how will I get used to so much hustle and bustle after living in a town of ten thousand people, surrounded by fields planted with corn and soybeans? And of course, there is all the work I didn't get done during my final weeks at DePauw, where it seemed more important just to savor its pleasures as fully and deeply as I could. I was so sure that when I got back to Colorado, I'd want to leap back into work mode - wouldn't I? Well, maybe not. . . . The drive across the country was wonderful. My mountains of stuff did fit comfortably into my Chevy Aveo, leaving room in the front seat for my stuffed rabbit, Ruby, and the thirteen CDs from the audio book I was listening to for that thousand mile drive: The Marriage Plot by Jeffrey Eugenides. It was satisfying to travel the same road I had traveled in the other direction almost two years ago. As before, I did the whole trip not on 70, but on the much quieter 36, which is just a two-lane highway for much of Indiana and Illinois and just about all of Kansas. There was no traffic, no trucks to pass at 75 miles an hour, just long stretches of rural America broken up with small towns with old-time drugstores and perhaps one small cafe or diner where I could refresh myself with hot chocolate and French toast. I stopped in Springfield, Illinois, to tour Lincoln's home and the law office he shared with Robert Herndon. Betsy-Tacy fans will remember that in Emily of Deep Valley, when Emily asks her former teacher for a recommendation for a biography of Lincoln to read aloud to Grandpa Webster, Miss Fowler replies promptly, "Herndon is still the best. The True Story of a Great Life." So of course I was thrilled to find a Betsy-Tacy connection. I stopped in Hannibal, Missouri, to eat a Huckeberry ice cream cone while strolling along the banks of the Missisippi. In Marysville, Kansas, I saw Pony Express Home Station #1. In Norton, Kansas, I stopped at the Gallery of Presidential Also-Rans upstairs in the First State Bank. Did you know that John Adams defeated Thomas Jefferson only to be defeated by him four years later? Or that Grover Cleveland won the White House, then lost the White House, then won it again, the only president to serve two divided terms? I didn't! Eastern Colorado is so vast and empty that I was afraid I'd run out of gas, given that when I did stop to fill up my tank, the kindly man who pumped the gas for me told me that it was 55 miles to the next gas station. 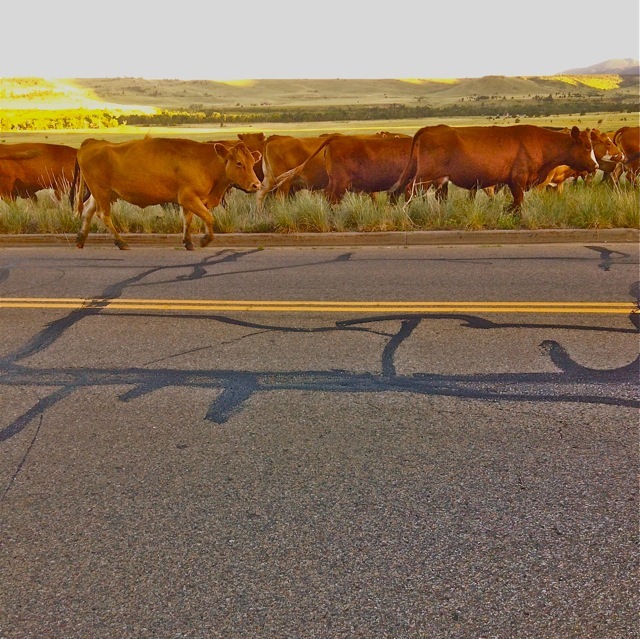 And then I was back in the traffic of the Denver metro area. I made room for the clothes and books by taking a huge quantity of my old clothes and books to the Boulder Goodwill. I found a home for the cookie jars on the top of my bookcases. The boxes of file folders remain a challenge. I really do need them all. Oh, well. That I generated so many piles of paper during my time away is testimony to how productive and happy these past two years have been. And maybe they hold a whiff of promise for how productive and happy the coming years can be. Human babies can't come two weeks apart, but book babies can. 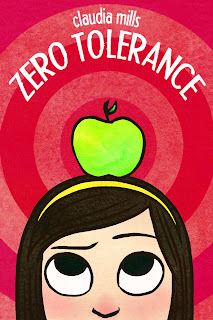 Today is the birth day of my middle grade novel Zero Tolerance, following on the heels of Kelsey Green, Reading Queen, which made her way into the world earlier in the month. This book is a departure for me in that it's more plot-driven than a lot of my books (although of course I hope that compelling characters are themselves driving the plot). Seventh grader Sierra Shepard is a star student and active member of her school's elite Leadership Club. But when she brings her mother's lunch to school one day by mistake - a lunch that contains a paring knife to cut an apple - she finds herself facing mandatory expulsion under her school's inflexible "zero tolerance" policies for possession of weapons, even though she turns the knife in to the school office the minute she finds it. This is the only one of my books where I wrote through to the end without knowing what was going to happen. Would Sierra really be expelled? If she's allowed to stay, would she even want to? This might quite possibly be the most adorable picture in the history of the world! I'm used to enjoying the annual conference of the Children's Literature Association as a weekend of exuberant play where I spend three scrumptious days doing nothing but hearing wonderful papers and catching up with dear friends. But this year I have official duties to discharge as vice president/president elect of this organization that I love so much. I have spent the past year in the vice presidential role, preparing to ascend to the ChLA throne at noon today. Well, not "throne" exactly: I'm going to be president, not queen, and presiding over a 750-member organization, not ruling an empire. But the responsibilities are still daunting, as the organization hosts a huge annual conference, is associated with the publication of two scholarly journals and a book series, presents many awards and grants, and much more. Of course, the president herself does little of this. The organization is extremely well structured, with the bulk of its work done both by a professional management company and by a host of astonishingly accomplished colleagues who volunteer their time to chair our many committees. But mine is a big job nonetheless, and the current holder of the presidency, Claudia Nelson (we call ourselves Claudia N. and Claudia M.), has amazing gifts, which include a brilliant brain, a generous heart, delicious wit, and patience for tireless toil. My best gift, I've come to realize, what I'm good at, really truly excellent at, is simply this: I'm good at loving things. It doesn't sound like much, but I think it's going to be enough to get me through the coming year of the Children's Liteature Association presidency. The president, after all, is above all a cheerleader, an encourager, an appreciator - someone who makes it easier for everyone who does the real work of the association to do the jobs they've been elected or appointed to do. I can cheer! I can encourage! I can appreciate! The ability to talk less and to listen more. The ability not to be confident that my own crystal-clear views about the obviousness of how things ought to be are infallibly correct. The ability to ask for help when I need it. The abilty not to procrastinate. This will be the hardest one! So maybe: the ability not to procrastinate on any task for more than a day. That seems more doable. I'm sure there are other skills I'll need as well, but this list is a start. I'll love, listen, and try not to procrastinate. Sounds good so far. “The Penderwicks at Play: Gender, Artistic, and Narrative Frolics in Jeanne Birdsall’s ‘Summer Story’"
I have to resist printing out the entire program for your delectation! You can find it online at http://chlaconference.org/conference. My own paper is on Pinky Pye and Ginger Pye by Eleanor Estes. My somewhat haphazard way of proceeding as a scholar is to take some book I loved as a child and try to think of something scholarly to say about it. This year the conference is being held at a casino resort, so the theme, appropriately, is "Risk and Play in Children's Literature." (Not every paper connects with the theme, but note the connections in the papers I referenced above). Here is the abstract of my paper, (which probably tells you more about Pinky Pye and Ginger Pye than most of you want to know!). Eleanor Este’s two books about the Pye family - Ginger Pye (1951) and Pinky Pye (1958) - differ notably from her three earlier books about the Moffats in shifting from the episodic format of the classic family story to a plot structure built around a single, unifying dramatic question involving the solving of a mystery: Who stole the Pyes’ dog Ginger Pye? What happened to the little owl lost at sea that ends up becoming Owlie Pye? In both books, the solution to the mystery is extremely obvious to the child reader, with insistent foreshadowing of the ultimate resolution and blatant telegraphing of every clue. This has been widely regarded by adult critics as unsatisfying. For example, John Rowe Townsend complains of Estes’s “plots of mystery and detection which call for a dramatic build-up, a logical progression toward climax, which the author is infuriatingly unable or unwilling to provide” (80). I argue that both of the Pye books can be read, not as failed mysteries, but as cautionary tales aimed precisely against suspense-driven storytelling techniques. In Pinky Pye, Papa’s desire to heighten suspense as he tells Mr. Hiram Bish about the discovery of his lost owl delays the conclusion of the story so long that the little owl’s life is threatened once again during the space of the story’s telling. With his flair for the dramatic, Papa is exactly the kind of storyteller that Estes is not. But storytelling, we see, can be a risky activity, a dangerous self-indulgence on the part of a controlling and manipulative storyteller. Ginger Pye also alerts the reader to the danger of story: the danger of getting the story wrong and believing an erroneous and ultimately harmful narrative. After the dognapping of Ginger Pye, Rachel and Jerry make up their own sensationalized story about the perpetrator of the deed, fixing upon the one clue of his “mustard-colored hat.” They draw a picture of their villain, “Unsavory,” picturing him as an adult who is perhaps the leader of a crime ring of counterfeiters, and present their picture to the local police chief. Everyone then proceeds to miss all the evidence clearly pointing not to an adult criminal but to a boy in Jerry’s class at school. Chief Larrimer later grumbles, “The young-uns threw me off the track with that picture they drewed of the man” (248). Jerry admits: “We threwed ourselves and all of us off the track” (23). The pictures we draw in our heads, and commit to paper, can shape – for the worse - the unfolding of real events. This is especially true, Estes seems to suggest, when the imagined events are exaggeratedly dramatic, offering a distraction that jeopardizes the denouement of the real-life story which they embellish. In pointing to problematic aspects of suspenseful storytelling, both books thus contain within themselves material for a critique of exactly the kind of fiction Estes is chided for not providing. Off to Biloxi I go! Last half-priced flavored martini at the Swizzle Stick (their Wednesday special), sitting outside on the courthouse square on a June evening. Tip: order the ginger-tini. Last summer classical music concert at Gobin church, yesterday evening featuring exquisite music for cello, harp, saxophone, and percussion. Last long chat with a colleague about which students we loved best this past semester and why (this is the kind of thing DePauw faculty can talk about for hours even weeks after commencement). Last lunch at the Downtown Deli, where the waitress greets me by asking, "So, the tuna melt again today? Or didn't you say last time you wanted to mix it up by ordering the gourmet grilled cheese?" Last trip to the Putnam County Library to go downstairs to the children's room to see what recent titles have appeared on their NEW BOOKS shelf and to chat with Cortina, the wonderful children's librarian. Last black raspberry ice cream at Dairy Castle, in the baby-sized sundae with hot fudge sauce. Well, actually, probably not the last one of those quite yet! Each time I have one of these "lasts" I wish I were staying in Greencastle a little bit longer, so I could savor one more Gobin concert, or tuna melt, or ginger-tini. But if I did, then THAT one would become the last one. I would have postponed the sweet sadness of the "last one," but there would still have to be a last one at some point. My consolation is to tell myself: not the last one forever. Just the last one, for now. Today is the birthday of a brand-new book. I thought maybe it was my 50th book for children, but it's my 48th; I just went back and counted. (I describe myself as the author of over 50 books for young readers, but I cheat a bit and count books once they are under contract and in the pipeline.) I sort of wish Kelsey had the honor of being the 50th, because the book is such a celebration of reading and readers. Like Kelsey, I entered reading contests as a child; I still remember the thrill of having my name in the Courier News as the third grader who read the most books in the North Plainfield Public Library summer reading program. 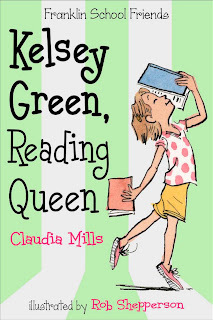 When the principal of Kelsey’s school announces a month-long reading contest, Kelsey is positive she will lead her third-grade class to victory. 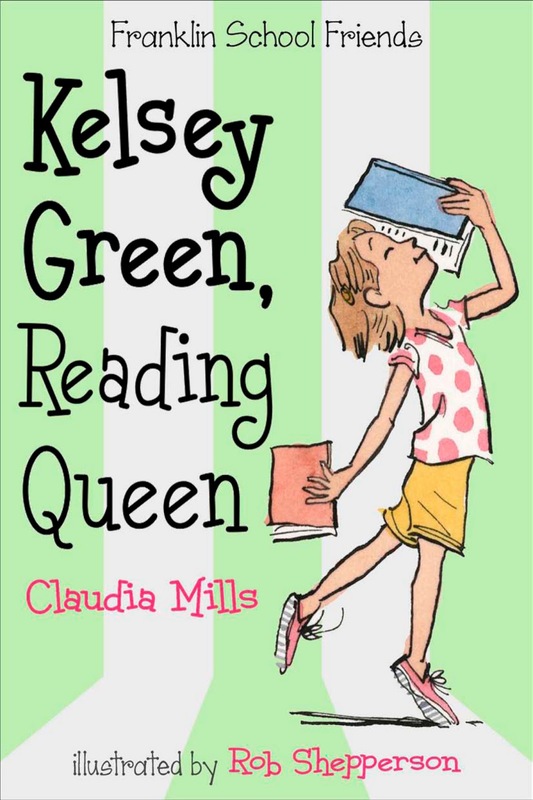 Kelsey loves books like her best friends, Annika and Izzy, love math and running, and nothing is going to stop her class from winning—or stop Kelsey from reading the most books. Except, maybe, for Simon, who reads as voraciously as Kelsey, or Kelsey’s parents, who insist she miss reading time to attend her siblings’ various functions (“Her mother called it ‘being a family’ ”). Certain that Simon is cheating, Kelsey enlists Annika and Izzy to help spy on him. Single-minded and a tad selfish, Kelsey isn’t always the most pleasant of third-graders—but she’s 100% realistic. And although Kelsey’s excitement about the reading contest skews her priorities, she redeems herself (and shares her love of books) when she helps out a classmate who struggles with reading. Shepperson’s (The Memory Bank) lively pencil illustrations capture the upbeat mood of this excellent first book in the Franklin School Friends series. Welcome to the world, Kelsey!